An hour and a half's drive east of Ocho Rios lies the rugged coastline of Port Antonio, where mist-shrouded mountains come right down into the sea providing hidden coves and beaches. Orchids and palms grow in profusion and waterfalls drop into fern-edged pools. 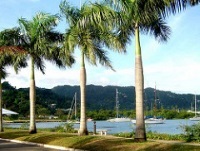 The town itself, which is nestled between twin harbours, is relatively unspoilt, with no high-rises, although there are some luxury resorts like Jamaica Palace Hotel. Beaches in the area are among the prettiest in Jamaica, especially Fairy Hill, San San, Dragon Bay and Boston Beach. Port Antonio was described in the past as 'the most exquisite port on earth', 'heaven on earth', and 'the most beautiful woman I have ever seen'. The seaside town has been a favoured destination for the rich and famous for decades, from Hollywood stars to billionaires and royalty, and the seclusion of its beautiful beaches, the azure sea, verdant hillsides and lush flora continue to enchant all comers. Port Antonio's banana industry boom during the late 1800s and early 1900s brought unprecedented prosperity to the area, but the Golden Age came to an end with the arrival of the Panama disease that almost completely wiped out the banana industry. The town still boasts a number of grand buildings from the days of the banana boom, such as the Musgrave Market and the Georgian Court House. The remains of lavish hotels, like the ruins at Frenchman's Cove, are a reminder of the extravagance and extraordinary wealth of days past. Today the main allure of Port Antonio is the undeveloped nature of its tourism trade, its unspoilt character, and the protection afforded to the environment and culture which has been fiercely undertaken by the local community to ensure that future generations will still be able to enjoy the natural wonders of this vacation paradise. We are looking for contributors for our Port Antonio travel guide. If you are a local, a regular traveller to Port Antonio or a travel professional with time to contribute and answer occasional forum questions, please contact us.